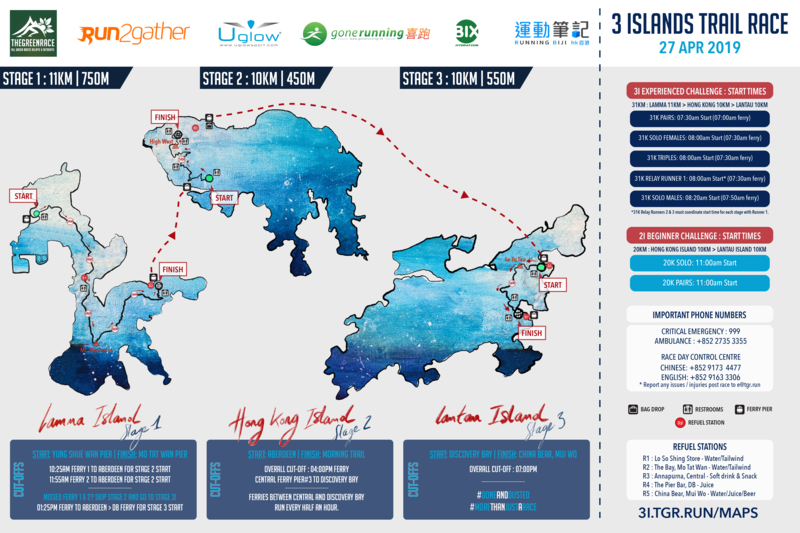 VladIxel.com, TGR.RUN & Run2Gather have come together to bring the Hong Kong trail community a unique new challenge -- 3 Islands Trail Race! This a unique event has two parts: a 4-week virtual trail challenge (23 Mar - 21 Apr) and a traditional running race on 27 April. In this new island-hopping race, runners will race over each island trail to catch a ferry to the next island, and repeat until they get to the finish line -- starting on Lamma, then to Hong Kong Island, and finishing on Lantau. The race will have up to three stages, with participants racing to complete each stage as quickly as possible -- travel time between stages will not be added to your finish time. Our goal, as always, is for all runners to have a fair opportunity to finish. If participants are late completing Stage 1 (Lamma Island), they will skip Stage 2 and head directly to Stage 3 - (Lantau Island). After this big accomplishment, completing 3 races in 1 day, we will all celebrate your achievement together at China Bear, Mui Wo! Note: This event is a challenging, semi self-supported, orienteering race -- part of the fun is to find your way to the next stage yourself, blazing your own trail without relying on course markings! If you’re not up for some rough or overgrown trails and a tough climb up Mt. Stenhouse, we recommend that you register for the 2i challenge instead: HK Island + Lantau Island.